I’ve been throwing up a storm this past week, with about a 50/50 satisfaction rate, which is about par for the course. Unless I’m really really happy with the finished pot, it goes into the reclaim bucket. 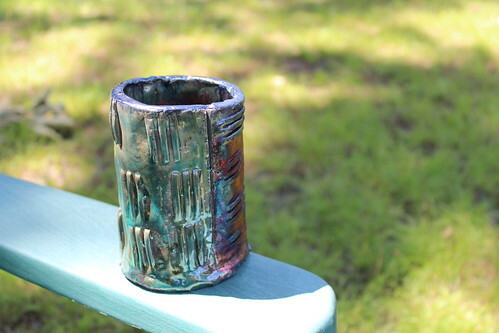 My mug handles are definitely getting better — they should be with all the practice! I’m running a full bisque kiln this morning and have ordered a few new glazes. Hopefully by the end of this week they will have come in and I can get the newly bisqued pots glazed and into the kiln for the final step. Several have gift potential, so I’m anxious to get them finished. I’ve made a pact with myself that there will be NO NEW STARTS until I finish my current WIPs. That’s all I want to say about that, as several of these also have definite gift potential. 🤫 Anyone else who will be working down to the wire on holiday gifting? I’ve recently fallen in love with banners and such so when I saw the Freak Flags in MDK Sequences it was all over but the knitting. The plan is to make a set of seasonal set for my mantle, with this particular set in fall colors. Winter will be next using blues, grays and whites. Have I ever mentioned that I’m a handbell ringer? Advent is upon us, a busy busy time for musicians, with extra rehearsals and the butterflies that go hand in hand with ringing in public,but it’s a labor of love. Aren’t they beautiful? I like the inside better I think. Hit the ground running this morning…..Baby Shepherd will be baptized at 10:30 mass this morning and we’re having a Baptism/Birthday/Belated Birthday chili supper this evening to celebrate. I’ll do my best to get photos of the Baptism Boy and Birthday Boys up on the blog in the next few days. Busy with blessings! I’m retaking the Basic Handbuilding class this summer, just to have a good handle on the basics, hopefully to try the pottery wheel in the fall. So loving this!